I think I've probably seen more artificial Strelitzia reginae flowers than real ones, in my life. At least if we're talking about real flowers that are still attached to the plant. (They're not extremely common cut flowers in Iowa, but one sees them occasionally -- the flower shop in the garden center where I used to work had them fairly often.) In the garden center where I worked, on the few occasions when we got Strelitzia reginaes in, the suppliers had usually (always?) stuck a fake flower into the pot. They were surprisingly good fakes, too: I was fooled on two different occasions that I remember. I wasn't tempted to buy this particular plant (it had scale, alas, plus I have so many BOPs -- mostly the white-flowering S. nicolai -- already that it actually seems excessive to me1), but the flower was still noteworthy. How long before I get a flower of my own, on the BOPs here in the house? Years, probably. Maybe never. It's not really something that happens indoors and in containers, not often. Do I care? Not especially. They're still cool houseplants. 1 Technically, I only have five: three S. nicolai, one S. reginae, and one that I haven't decided what it is yet but really really hope is S. reginae because nobody needs four S. nicolais. I've never had one to maturity but I left a seedling of one year old with a friend of my mother when I went to University. It flowered after seven years. It was kept in a conservatory and mostly underpotted, it lifted itself out of the pot on occasion. I suspect that plenty of light and root restriction will encourage flowering, as long as they are kept warm and fed for a large portion of the year. I had previously been interested in acquiring one of these at some point, but I have associative issues with it and this certain novel I read... Maybe one day I'll get over that and treat the plant with the purchase it deserves from me. 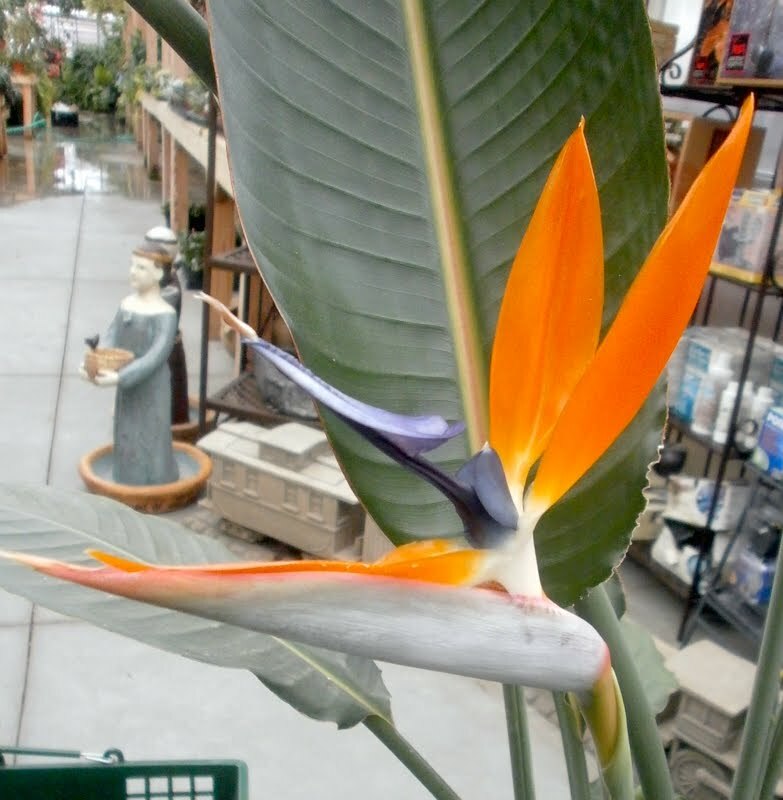 Hi, the strelitzia reginae is a really hardy plant. My dogs tramle on them but they keep on popping up. This one's a keeper. What is that leaf in your header. Looks like what I've got, but I don't know its name.Hope you can help. Well, they're fairly closely related to bananas, and they have big, broad leaves like bananas. It's understandable. That's understandable too. But S. nicolai, at least, is a good indoor plant if you have room and light enough. The header photo is an unidentified variety of Caladium. Strelitzias and bananas used to be in the family Scitamineae, literally meaning "the delicacies" because there were so many tasty foods and spices in it. This family was broken up sometime at the end of the 19th century to make the Musaceae (bananas), Zingiberaceae (gingers), Marantaceae (arrowroot) and Cannaceae (another sort of arrowroot). This has been split to add Costaceae, Heliconiaceae, Lowiaceae and Strelitziaceae. The order is now known as the Zingiberales. Lovely lot of pretty and useful plants. Not just the leaves but also the flowers of Strelitzia reginae resemble banana (Musa spp) flowers. We don't quite have ideal banana climate here in Los Angeles, but sometimes you catch a particular banana plant in a good enough microclimate that it sets flower, and the similarities are striking. Paul, I can't believe I missed the FarScape episode where they provoke an invasion of Earth by mentioning that we have those pretty flowers at home. I did see the chrystherium (gold beast?) being grown and assumed it was just chosen for being alienish and easier than making plastic alien flowers. Cool, I must now watch all the re-runs on FX or CBS or wherever they are now.